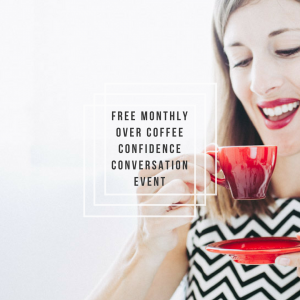 FREE Monthly Event – Join us for a Confidence Conversation over coffee. An informal gathering for women who are ready to get conscious about their confidence. Each month is a new topic, so come join the conversation! This event is ideal for women who currently work for themselves but want to take their mindset to the next level. Your confidence (or lack thereof) will stop you from making the necessary changes but we’re all in this together! By the end of this free talk, you’ll have a new awareness, new tools & techniques to try and new friends to call on for support, so you can impact change in your life and business with confidence. Confidence is the key to helping you show up in a more significant way, and I want to show you how to get started on a confident note. I’ll be sharing some insights & handouts, there will be time for Q&A, and then some delicious networking over coffee. What confidence-related topics would you like to chat about?